Take advantage of our accurate media directors and media managers email database and connect with your target audience. Buy and download our managers and directors of media mailing list to receive the tools necessary to approach sales leads and connect with professionals. Directors of media or media managers collaborate with other team players to create strategic marketing and advertising plans. Many have built mutually beneficial ties with journalists and other media sources to achieve maximum media coverage for their clients or companies. Our media director email list allows you to directly contact these major decision-makers and offer your products and services as a solution to their media or advertising campaign hurdles. 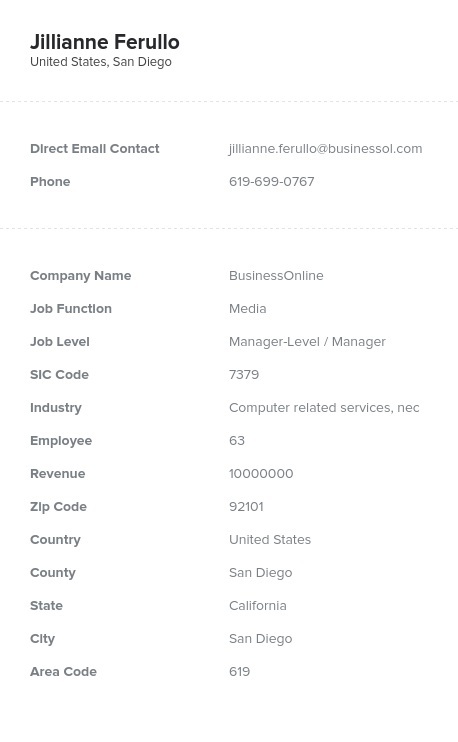 This pre-built list of premium sales leads contains the human-verified contact information of media directors and media managers. Our media directors engineers email database has valuable data like names, email addresses, telephone numbers, and fax numbers. When you buy and download this verified B2B email list, you can effectively connect with media professionals and leverage targeted sales leads. Our premium media managers and directors mailing list is easy to download minutes after purchase and is CRM-ready. With the tools you need to effectively build your business in hand, you can master direct marketing. Our bulk email list is also great for building strong B2B relationships with industry professionals, while securing sales leads and ultimately increasing your bottom line. Buy, download and integrate our media directors and media managers email database and start connecting with industry experts today.